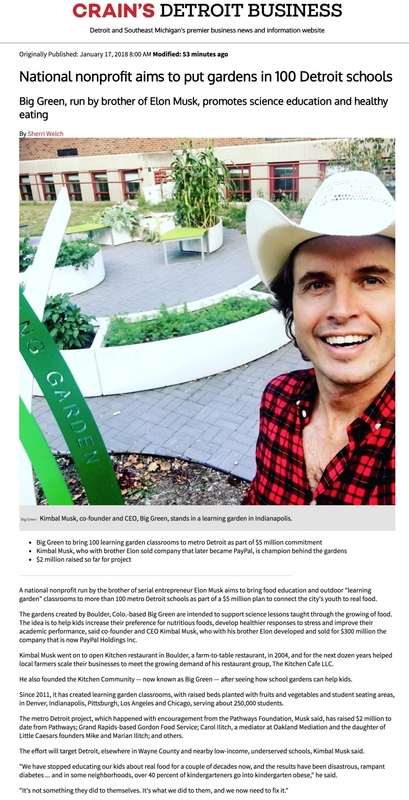 For nearly a decade, Kimbal Musk — Elon’s brother — has been on a mission to bring fresh produce to cities across the United States. In 2011, Musk launched a nonprofit program, called Learning Gardens, in 300 public schools in American cities. Part-playground, part-outdoor classroom, the learning gardens serve as spaces where students learn about the science of growing fruits and veggies — and that they can taste great, too. Now Musk is taking his nonprofit national and renaming it “Big Green.” In April, 100 schools in Detroit, Michigan will break ground on learning gardens. The Detroit project is backed by $5 million in funding from donors including Gordon Food Service, Pathways Foundation, and philanthropist Carole Ilitch. He also founded the Kitchen Community — now known as Big Green — after seeing how school gardens can help kids. Since 2011, it has created learning garden classrooms, with raised beds planted with fruits and vegetables and student seating areas, in Denver, Indianapolis, Pittsburgh, Los Angeles and Chicago, serving about 250,000 students. The metro Detroit project, which happened with encouragement from the Pathways Foundation, Musk said, has raised $2 million to date from Pathways; Grand Rapids-based Gordon Food Service; Carol Ilitch, a mediator at Oakland Mediation and the daughter of Little Caesars founders Mike and Marian Ilitch; and others.